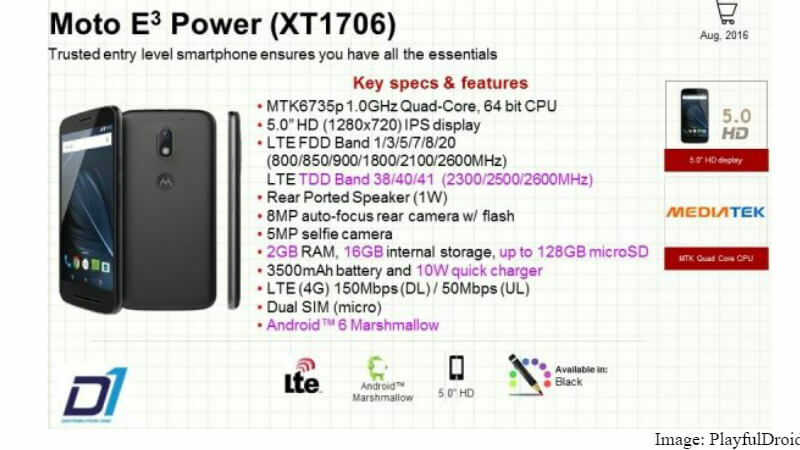 Over the specs, Moto’s upcoming E3Power is powered by MTK6735p 1.0 GHz Quad-core SoC chipset with 64 bit CPU. This CPU is coupled with Mali T-720 GPU. E3 Power features a 5.0 inch HD IPS touchscreen with 16M colors. The resolution of the screen of the device is 1280 x 720. E3Power supports LTE FDD Band 1/3/5/7/8/20 (800/850/900/1800/2100/2600 MHz) and LTE TDD Band 38/40/41 (2300/2500/2600 MHz). There is a rear ported speaker of 1W in the device. On the back of the smartphone, there is a 8 mega pixels auto focus rear camera with LED flash. On the front board, there is a 5 megapixels selfie camera especially for selfies and video calling. The company is offering a DDR RAM of 2 GB with an internal memory of 16 GB. The internal memory of this smartphone can be upgradable up to 128 GB using a microSD card. There is a 3,500 mAh battery in the device. The 10W quick charger supports rapid charging technology. It is a dual SIM (micro) smartphone powered by Android OS Marshmallow v6.0.1. It is expected that there is a fingerprint sensor in the device along with other standard sensors. For connectivity, the company is providing WiFi, Bluetooth, GPS and NFC. There is also an expected FM Radio in the device for the entertainment purposes. It is expected that the company will soon launch this smartphone in India. It is roughly priced at Rs. 9,500 or $141.